I even found a caretaking job that involved painting artwork around the property. Are you looking to travel long-term, but don’t have the cash to take off for months or years at a time? Or are you already on the road wanting to extend your trip, but have no money to back it up? And are you a hard-working, eager volunteer, ready to get your hands dirty (sometimes literally)? If you answered yes to any of the above questions, then you may be a great candidate for caretaking your way around the world. As a Professional Hobo, I am working (or rather, caretaking) my own way around the world. I travel full-time and professionally, volunteering in trade for my accommodation, and earning a few extra bucks with side jobs and Internet work to take care of other expenses. As such, it is a fully sustainable way of traveling, allowing me to theoretically do it forever. The opportunities for this lifestyle are boundless—you just have to know where to find them and whether or not it is your cup of tea. Literally, caretaking is the act of taking care of a property or building (or sometimes a person or people). And in some cases, that is exactly what the job entails. Figuratively speaking though, caretaking is a way of living which involves trading work for accommodations in some form. You work part-time on the task at hand, and in return, you will receive a place to live (either free or subsidized), and sometimes extra perks like training, food, or even transportation depending upon the arrangement. There are caretaking positions available all over the world, and a number of different resources (covered later) allow you to find these positions. What Does it Take to be a Good Caretaker? There are a number of qualities that make a good caretaker. You may not immediately and inherently possess these characteristics, but many of them can be learned and incorporated into your way of living without too much grief. In many cases it just depends on how flexible you are and how badly you want to be able to travel long-term and be free of the dreaded "rat race." In my "former life” I was a high-profile business owner in Canada. Image was paramount, and I rarely left home without a suit on and an assortment of business gadgets dangling from every limb. Less than one year later as a caretaker in Hawaii, and I was milking goats and recycling my own poop. Juxtaoppose these images of me and you might have been hard-pressed to see the resemblance. Neither image was a deviation from who I am as a person; rather they were just two very different sides of me. I initially struggled to embrace such a drastically different lifestyle, but in the end I couldn’t have been happier with my decisions. Accommodations range from tent sites to 5-star digs—the possibilities are endless. What Does the Job of a Caretaker Entail? The specific tasks of a caretaker vary dramatically from position to position. I have managed youth hostels, maintained ecologically sustainable permaculture properties, tended estate gardens, taken care of pets, created administrative and marketing plans, and cleaned guest houses. And although what I have done covers a wide range of typical caretaking responsibilities, there are any number of deviations from this theme. 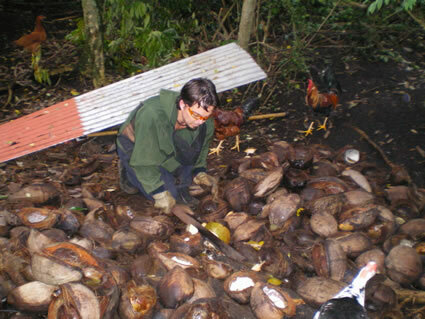 You could be chopping coconuts or doing computer work; the jobs vary from place to place. Who is a Typical Caretaker? Caretakers vary in nature almost as much as the range of caretaking jobs do. Younger retirees form an increasing demographic of caretakers; those who are finished with the work force and eager to travel and experience new things, but who many not have the financial ability or desire to travel long-term as typical tourists. Artists (writers, visual arts, and musicians) also gravitate towards caretaking (as I have), since working part-time in trade for accommodations leaves lots of time to hone a craft of choice. And young people looking to escape the typical life laid out for them (either as a gap year traveler or lifestyle choice) make for yet another type of caretaker, as do mechanically minded people who don’t put much credence in the idea of “home” and enjoy a nomadic lifestyle. How do I Find Caretaking Jobs? There are many resources you can explore for caretaking positions around the world. WWOOFing is a common source for agricultural-centered caretaking positions. Both imply that work on organic farms is the full scope of available positions; however I found my hostel management position on Organic Volunteers, and discovered numerous opportunities through surfing WWOOFing sites that have very little if anything to do with farming or agriculture. If you search around enough, you can find positions at both the above sites for artist retreat internships, cooking, teaching, caring for children, nursing the elderly, farm maintenance, and handy work. There is usually something available for anybody interested in a given lifestyle. There are also many volunteer organizations that piggyback on the WWOOFing platform, which you will find as you poke around the internet. 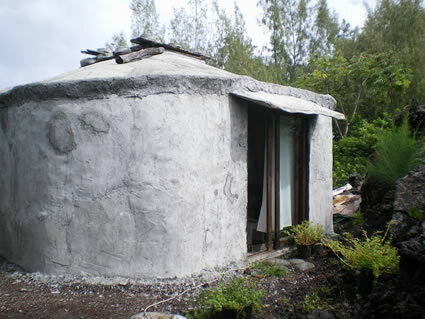 The WWOOF site alone provides numerous links for volunteering, eco-tourism, and working exchange sites that are worth researching. Work Away and Help Exchange are two such examples, featuring opportunities worldwide to trade some elbow grease for a roof over your head. If you are interested in house and pet sitting, House Carers is a great site for you. Opportunities range from a few days to a few months, with a large contingent of the listings located in Australia and New Zealand. And one of the best resources I have found to date is the Caretaker’s Gazette, which connects caretakers with rent-free living positions. Membership will entitle you to the quarterly newsletter chock full of global listings (available online or by mail), as well as regular updates with new listings that come through at least once a week. Again the variety of positions available is staggering, as are the locations in which you can enjoy them. Some of the jobs listed in Caretaker’s Gazette are full-time paying jobs, while others are simply part-time volunteer work exchanged for free room and board. From cooking to gardening to grunt jobs, you can find a caretaking job just for you. Aside from the obvious ability to extend your travels or take off for an inexpensive long-term trip, caretaking has its own set of advantages. If travel to you means really getting to know a place, culture, language, and people, you can’t really do anything more than skim the surface if you are passing through as a backpacker. By caretaking and staying for a few weeks to months (to even years) in one place, living and working with locals, and integrating into the local community, you will see the underbelly and inner workings of your destination; you may even learn to call it home for a time. Sometimes you will be delighted by what you find, and other times you may feel disillusioned. Either way, you can say that you truly saw that place for what it was, and you will likely walk away with a whole new set of skills under your belt and a wide variety of friends in far away places. 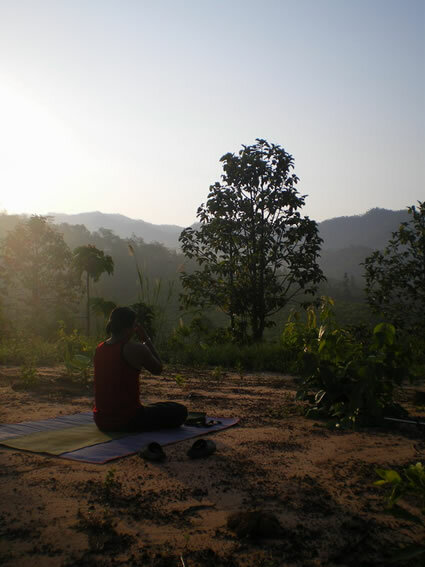 Try teaching yoga with a backdrop to die for. The interview process for many caretaking positions is accomplished online through email and occasional phone conversations. Since many caretakers will be traveling to the destination specifically for the caretaking job (I traveled to Hawaii for my first position, across Australia for another, and was on my way to Ecuador for a third before it fell through), face-to-face interviews aren’t always possible. This is a giant leap of faith not only for the host but also for the caretaker. As such, be sure to develop an exit strategy that works for both parties. Many jobs will require a minimum commitment period, but if it isn’t working for either party, fulfilling a 6-month commitment could feel like a prison sentence. By stating clearly that either party can give notice of a few weeks or a month, both the host and caretaker will be protected from suddenly being homeless or conversely without a needed employee, and can make necessary arrangements in advance of the relationship ending. Also, don’t be afraid to go with your gut instincts. A host with whom I was once interviewing set off some red flags. But because the position description seemed idyllic, I ignored the warning signs and accepted the job. Sadly, the very things that mildly concerned me about the position turned out to be huge problems (not only for me, but for a series of previous and future caretakers too). The days felt like years, and nobody was happy or productive as a result. The wrong caretaking position can be terribly difficult to get through, so do yourself a favor and listen to your instincts if you feel something is amiss. Since learning about exit strategies and trusting my gut, I have enjoyed caretaking positions around the world that are immensely satisfying and incredibly varied. Having good references and experience in the industry now paves the way for me to continue to caretake my way around the world—getting to know the locals and planting roots (literally and figuratively) everywhere I go. Are There Costs While Caretaking? WWOOFing: Each country has its own membership process, and upon joining you will receive a booklet (only some countries are fully online) with WWOOFing members and opportunities for the area joined. Costs vary by region, and you would be best to join well in advance of your travels to get the most use out of your membership booklet. Help Exchange: There is a free membership option so you can acquaint yourself with the website and various listings. However if you really want to make use of the site, the €20 Premier membership (lasts two years) allows you to contact hosts directly through the site and read reviews—a helpful service. Workaway: The €15 yearly membership will get you started on a platform similar to the above sites. Sabbatical Homes: Offers caretaking opportunities abroad. See Nora Dunn's piece on House-Sitting Jobs Abroad for more related ideas on free or low-cost accommodations abroad and read her ebook How to Get Free Accommodation Around the World. Nora Dunn is a Professional Hobo and freelance writer, traveling the world one caretaking position at a time. She has lived in ocean-side yurts, camper vans, hostel rooms, and most recently, 5-star accommodations, all in exchange for part-time work. You can learn more about her caretaking adventures at www.theprofessionalhobo.com.